You can catch Prof. Donald L. Miller on CSPAN not once but twice in the next few months. 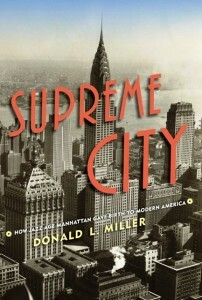 On Saturday, Miller will discuss his latest book, Supreme City: How Jazz Age Manhattan Gave Birth to Modern America, at the Savannah Book Festival. CSPAN 2’s BookTV will air the program live at 4:10 p.m. EST. Miller often engages a team of students to assist in his projects and Supreme City was no exception, with students doing research, collecting photography, and overseeing the book’s bibliography. The book, a monumental portrait of the monumental 1920s, when Midtown Manhattan became the capital of everything, was named one of Kirkus Reviews’ top non-fiction books of 2014. It has received favorable reviews in many major national media outlets, including The New York Times, The Wall Street Journal, Vanity Fair, The Washington Post, The Philadelphia Inquirer, and The Daily Beast. …and his jump shot was never any good either!